Summary: Where else could you find renowned pathologist, Cyril Wecht and Super Bowl MVP, Santonio Holmes, sipping lemonade on a porch swing than on the YaJagoff! podcast? This J&D Waterproofing final porch stop at the Conway’s in Bloomfield lands the duo interviews with these two legends, comedian Ray Zawodni and music sensations Chase and the Barons. It’s a long one folks, but again we had Cy and Tone—this could have gone on for hours! Don’t see the play button in your email? Well, click the one below here so that you can listen to the podcast while you work, get ready for back to school or stare at the rain outside. 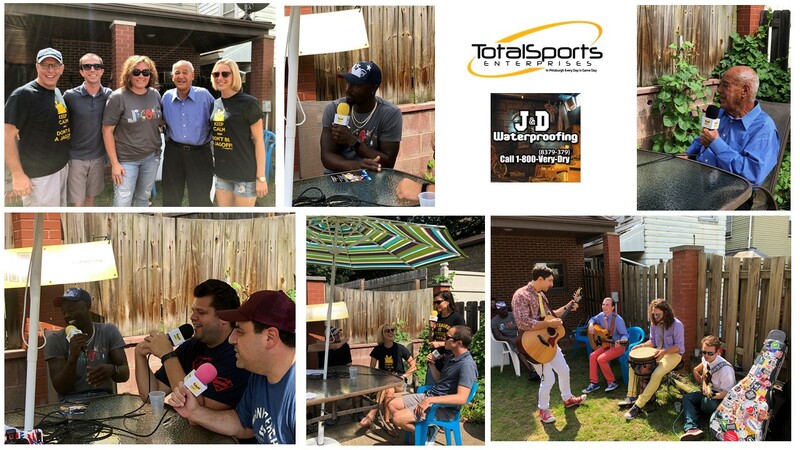 4:42 Kathleen and Kyle Conway and Shawn from J&D Waterproofing: The Conway couple talks about their first week in Bloomfield and discuss letting Shawn see their may-need-waterproofed basement. They are stoked to meet two Pittsburgh legends, but who do they fan boy and fan girl over? 10:53 Dr. Cyril Wecht: The classy Pittsburgh icon is an elite storyteller when it comes to his 50+ year career in medicine and law. An only child born of immigrants in the 30’s was destined to be a doctor, but he played violin and was head of or president of every possible group or club imaginable. His kids and even grandkids followed in his footsteps. 44:32 Santonio Holmes: Tone time is upon us as Santonio prepares for his reprise of the Strikes Against Sickle Bowlathon October 8th. He chats up his Superbowl moments, creates awareness about his son’s disease and challenges you to battle him at the pins…or maybe darts if bolwing isn’t your thing? Learn what is new to the bowling event this year. Ray Zawodni: Ray reprises his role with Santonio from last year’s porch tour but admits that he did not take Tone’s tips on how to save money. He joins in the Tone tour jokes as an outsider but appreciates the MVP’s work ethic. While he has quite a few comedy shows, don’t expect him at the lanes since he is still a starving artist…unless he can be a stowaway. 1:14:28 Chase and the Barons: With Weezer and old school rock molding the style of music played, these fine young men are playing at all the hot spots from festivals to private parties to the Santonio Holmes Strikes Against Sickle Cell event! They play a mean Scooby Doo theme song too! SPONSOR: Total Sports Enterprises will be at the Pgh Irish Festival from September 7-9 at the River Plex at Sandcastle. Support and enjoy the Pittsburgh Irish festival while bidding on favorite black and gold and Irish related athlete merchandise. Plus, expect a signing the Saturday before every home game at Total Sports Enterprises at the Mall at Robinson. For tickets, merchandise and VIP possibilities, visit TSE shop.com.